You know one of the best things about summer? Time. Time to read. And do other stuff, but time to read is a wonderful thing. As I’ve said, I’ve read a lot of fantasy. So I think that this week, I’m going to try to do a book review each day on some of my favorite books. The Princess Tales books are basically re-told fairy tales for younger children, but anyone who still enjoys fairy tales will enjoy these. They’re small books, the sort that can fit in your pocket. The age range is about 8 and up, but I could see anyone who’s starting to read chapter books loving these. There’s pretty much nothing scary in any of them. Alright, so you have a couple of traditional fairy tale elements, such as an evil fairy cursing Sleeping Beauty, but that’s mostly it. In general, the tone of the books are very lighthearted and truly fluffy. Levine does an excellent job of taking traditional tales and tweaking them in a charming way. Sleeping beauty, for example, is the smartest person in the world, doesn’t sleep before she pricks her finger, and researched “dwindling unicorn habitats” before the age of 6. The Prince and the Frog is combined delightfully with Rapunzel. Sortof. Not quite. (It’s called “For Biddle’s Sake.” You should read it.) And the tale of the Princess and the Pea? That’s just the “final exam” in a long serious of tests for whether someone’s truly a princess. Levine writes in a charming, easy to read, funny manner. I highly recommend her books, and The Princess Tales especially, for anyone who has ever enjoyed fairy tales. This entry was posted in Book Review, procrastinate, real world, Webmaster and tagged book review, procrastinate, real world, webmaster on June 30, 2013 by Webmaster. I had one of the most perfect ice cream sandwich experiences recently. And it demonstrated to me what ice cream sandwiches should taste like. Uh, like bread and ice cream? …Oh, have you never had an ice cream sandwich before? Uh… no. Most of us don’t have ice cream. I’ve had it a few times, when we performed exceptionally well for wizards who have their magic freezing boxes. But none of us would put ice cream between bread! Haha, no. that’s not an ice cream sandwich. There is no bread in one. No, a normal ice cream sandwich is made of two cookies sandwiched around a nice serving of ice cream. That does sound a lot better than what I thought. It is. And then I made it even better. They’re sort of a crunchy cookie-ish thing. They’re normally bought from local stores; fairly cheap, too. Quite a common snack for younger children. I’d never actually had a home-made graham cracker before! So you decided to make some for… fun? Bit of a funny story there, actually. I wanted a graham cracker, but we didn’t have any where I live. So I decided to try to bake some to make up for it. And then I realized we didn’t have an ingredient. So I bought that ingredient, and didn’t bother buying the graham crackers themselves. So, I home-baked some graham crackers. And they started off crunchy, but sort of went a little softer over time. In fact, they made the perfect “sandwich” part of a home-made ice cream sandwich. Especially with gourmet coffee ice cream in between! It was amazing. It tasted… like happiness. And thunderstorms. With a touch of fairy-dust and dancing unicorns thrown in for good measure. What? Of course not! That’s hyperbole! …ah. I take it you haven’t actually eaten fairy-dust either, right? Or a thunder storm? Of course not! That would be impossible. Right… Different worlds. Don’t mind me. Anyways, Fluffsters, happy Saturday! I hope you have a great weekend. This entry was posted in pointless, real world, Webmaster and tagged food, pointless, real world, webmaster on June 29, 2013 by Webmaster. Yesterday’s post was… interesting, wasn’t it? Anyways, Today I’m going to try to rectify the situation. 1) Plot to take over a world. Not necessarily this world, of course. That would be bad. Probably. But plot to take over a world. I hear there’s nobody on Neptune, yet! 2) Write about a world you could take over. And then find some way to teleport yourself into the story, as Dictator of the World. Then you could really take over the world! And you never hear of any world dictators complaining of boredom, do you? Uh… Does any world actually have a world dictator? I’m sure there’s one somewhere. But moving on. 3) Learn woodworking. Create a musical desk. I mean, isn’t that just fantastic? How can you possibly be bored when making something like that? 4) Waste too much time on YouTube. On the other hand, if you’re bored, I guess you’re not really wasting too much time. 5) Read a good book. Not on “advanced empirical methods for statistical studies on the eating habits of the fruit-fly.” (whatever that would even be.) No, instead I’d read something like The Enchanted Forest Chronicles. Well, there you go! Five ways to defeat boredom! Happy Friday! I hope you have a great weekend. This entry was posted in list, procrastinate, real world, Webmaster and tagged escape boredom, list, procrastinate, real world, webmaster on June 28, 2013 by Webmaster. From what I understand, your world is currently experiencing Summer. One of the staples of Summer, from what I can gather, is perpetual boredom. After you are bored, solutions can be considered. But until you are bored, what point is there to any of the solutions? After all, if something isn’t broken, don’t fix it. But I digress. Today, I am here to give you a list of ways to try to live your Summer to its fullest: By becoming bored. 1) Sit in a very crowded room, with nothing to do. Especially if you cannot communicate with anyone. I’m sure you were thinking my first recommendation would be to find someplace quiet and sit. That is a bad solution. If there’s nothing else going on, you can think. If that fails, you can take a nap. With a crowded room, however, you cannot concentrate on anything. You cannot even concentrate on your own thoughts! Believe me, this is one of the best methods for achieving boredom. 2) Try to read a textbook on advanced empirical methods for statistical studies on the eating habits of the fruit-fly. Or something equally esoteric. If you’re a statistics nerd, try reading James Joyce. 3) Do 2… in Hebrew. Greek, if you already know Hebrew. That way you have even less chance of understanding what’s going on. That confusion will inevitably lead to boredom. Wait a second… I don’t think it’s possible to have less of a chance of understanding what’s going on. You can’t have less than a zero-percent chance of something, right? Ah, I can tell that you haven’t read “Advanced Empirical Methods for Statistical Studies on the Eating Habits of the Fruit-Fly.” The statistics would explain that possibility to you. 4) Put the fluffiest piece of music you can find on perpetual loop, and lock yourself in a room with it for a week. This is actually very similar to 1. But this has the added bonus of killing 7 days! 5) Paint some ebony black, an emerald green, a ruby red, or ivory white. Do your best to match the colors. Please note, this will be a slightly more expensive option. I hope, dear readers, that this helps you attain the full Boredom that is promised with Summer! Have a fantastic Thursday! This entry was posted in fluffy, list, pointless, real world and tagged Fluffy, list, pointless, procrastinate, real world on June 27, 2013 by Fluffy McGiggles. Projectile Paint Ruined my Pants. I was doing a mini project while waiting for some dough to chill so that I could roll it out. I needed paint. Just a small, tiny, miniscule drop of paint. So I got my paintbrush primed, and pressed on the paint-bottle, and a dab of paint went flying. It wasn’t until at least an hour later I realized that it landed on the knee of my pants. Rather, just above the knee. I blame the Rainbows. They were comfortable jeans, too! And the paint is designed to work on fabric, so I probably won’t be able to get the stain out. This entry was posted in pointless, real world, Webmaster and tagged pointless, real world, webmaster on June 26, 2013 by Webmaster. Hello, Fluffsters! It’s a bit past my bedtime when I’m writing this, so my apologies in advance. No, no. I’ve got an idea. It just might not be a very good idea. What would happen if you were able to turn a miniature video camera into a golf-ball? …You’re right. Not a very good idea. But it is an idea. So going back to the question. I think that one or more of several events might occur. First, the video camera might break. That would be sad. So whoever was using it would need to be fairly careful with it, to make sure it wasn’t hit too hard. Fourth, it could be used as a spy device by the Rainbows. Don’t ask me how, but I know they could hack into the video system somehow. How about you, Fluffsters, any other thoughts? This entry was posted in list, pointless, question, real world, Webmaster and tagged pointless, question, real world, webmaster on June 25, 2013 by Webmaster. Sometimes residential colleges are a pill. If you’re going to expand on that, you’re going to have to do so on you own. I am not asking you if you’d care to elaborate. Ooh, “Care to elaborate”? Yes, I would care to elaborate! Hey, that’s no fair! You changed my punctuation! Ah, but I didn’t quote your punctuation. That means that it’s ok. So yes, I will elaborate. In fact, this elaboration will also help with one of the mission statements of the website! We have official mission statements? When did that happen? Well, not official mission statements. But it’s on the front page. This explanation will help our valued Fluffsters procrastinate! Ah, by making them read through all of your topic-changes before getting to the end of the post? I thought I did that anyways. You’re sidetracking me on purp- Wait, no. I’m not falling for that this time. A craft that looks epic but that I can’t do thanks to dormitory restrictions. Darn. There went that tactic. So, I recently came across a fantastic craft tutorial for making hand-decorated candles. Basically, you take some white tissue paper, draw on it with markers, melt it into the candle, and voila! Instant decorated candle. But alas, lamps with shades, coffee-pots with open burners, fabric in front of windows, candles, and pretty much any other form of flammable material or things that can start fires (except for cigarette lighters) are strictly forbidden at my school. …But cigarette lighters are allowed? But candles, as I was saying, are very strictly forbidden. That means that I cannot use any candle that I would consider decorating in such a fashion. Alas, such is the tragedy of dorm life. Such a hard life you lead. Alas, indeed. Woe is me, alas, and alack! Wait, did you just switch roles on me? I thought I was supposed to be the overly dramatic one here! I think the difference is that when you do it, you’re acting. That’s a scary good point. Well, Fluffsters, happy Monday! I hope that tutorial helps you procrastinate a bit. This entry was posted in crafts and projects, procrastinate, real world, Webmaster and tagged craft, procrastinate, real world, webmaster on June 24, 2013 by Webmaster. You know, why do they even call it that? Sunday. Why is it called that? It’s frequently cloudy. Or rainy. So why is it “sun” day? I guess that if you look at the frequency of how often it’s sunny, the distribution would be such that probably about 1/7 of the sunny days are Sunday… right? I mean, if they’re evenly distributed? And why only sunny days? Why don’t we have Rainiday? Or Cloudiday? Wouldn’t it be Randay or Cloday? Just going from the rules the rest of the days of the week lay down? Huh, you might be right! Which would explain why we don’t use them: It just sounds unnatural! Thanks, Fluffy! You really helped clear that up. Uh… right. Sure. You’re welcome? But yeah. So, happy Sunday to you all! I hope there’s a lot of brightness in your day today. And have a wonderful week! This entry was posted in pointless, real world, Webmaster and tagged pointless, real world, webmaster on June 23, 2013 by Webmaster. Happy Saturday! As usual this month, that means there’s a new design in my CafePress New and Now section. …”If you use enough qualifiers, you’re usually right”? Where did that come from? In real life, I sometimes have a tendency to use what some people consider to be a few too many qualifiers in real-life speech. Oh. Just in real life, I see. Anyways, a few people may have mentioned this a time or twelve. Per day, it sometimes seems. So my usual reply is that with my use of qualifiers, I’m seldom wrong. After all, I’ve mostly just said that certain things might be true under some circumstances. Huh. Are you working on a thesis of some sort? Not as far as I’m aware… Why do you ask? Hm. Yeah. Back to the topic. You see, I thought that it might be amusing to create a shirt design that explained my logic. …Yeah. Looking back at this post, if there was a competition for abusing qualifiers, I’d bet on you. This entry was posted in CafePress, pointless, procrastinate, real world, Webmaster and tagged CafePress, pointless, procrastinate, real world, webmaster on June 22, 2013 by Webmaster. I was doing a bit of stuff with a nearly magical substance today. It’s something called “ganache.” It’s just cream and chocolate, and amazingness. It’s one of my two favorite cake frostings at this point. (The other is cream cheese frosting.) I mean seriously. Cream and dark chocolate: Where do you go wrong? The real magic, though, comes in whisking it together. It’s seriously amazing. First you have your cream over your chocolate chips. 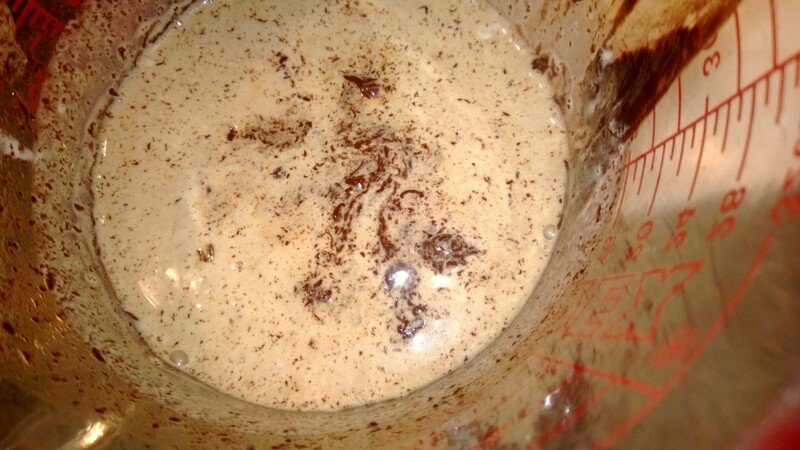 As you whisk it together, you get more chocolate shreds, and it starts to look like an oreo-cookie milkshake. Doesn’t it look a bit like oreos crunched up in cream? Within about 5 more strokes, though, the real ganache starts to appear. 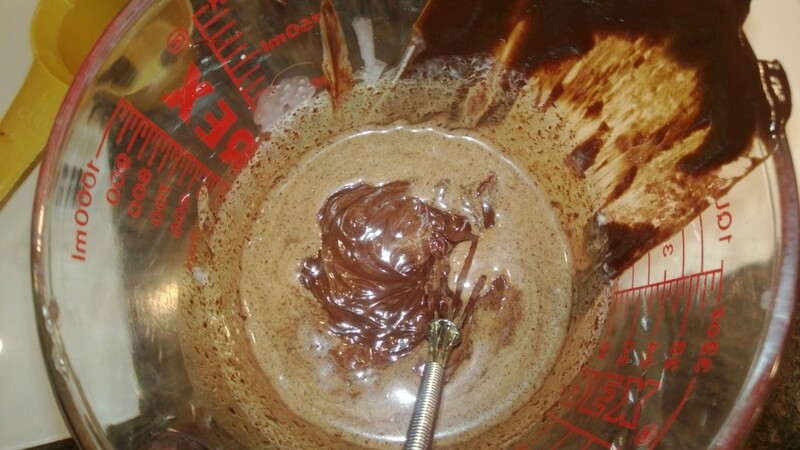 Ganache forming in the center of the ingredients. I seriously think that making ganache should be a science experiment for kids just starting to learn about chemistry. It would be a “sweet” way to learn science. Do I want to know if you wrote this post just to be able to use that pun? …Probably not. But happy Friday, Fluffsters! And just a reminder, my current new design in my cafepress store is on sale until sometime either today or tomorrow. Check the New and Now section for the current low prices, and the other part of my store for all my other designs! This entry was posted in cooking, food, ooh shiny, Webmaster and tagged chocolate, food, real world, webmaster on June 21, 2013 by Webmaster.